Panasonic once again made artistic vision reality with the supply and installation of projection-mapping systems at i Light Marina Bay 2017 in Singapore. Aiming to promote sustainable light, the event was themed “Light and Nature” and attracted local and international artists who contributed multimedia for projection around the city waterfront. The festival is organized by Urban Redevelopment Authority (URA) and featured projection shows that dazzled audiences every night from March 3 to March 26. Media display was facilitated by efficient lamp and laser projectors installed by Panasonic technical staff, and included a “Secret Galaxies” exhibition at ArtScience Museum and “The Body of the Sea”, where images decorated Singapore’s iconic Merlion statue. Panasonic has been integral to staging i Light Marina Bay since its inception in 2010, working with organizers and creatives to facilitate world-class entertainment with class-leading projection services and support. Through these partnerships, Panasonic aims not only to be No.1 for projection in the industry, but also the No.1 provider of solutions encompassing every aspect of audiovisual logistics at major events. 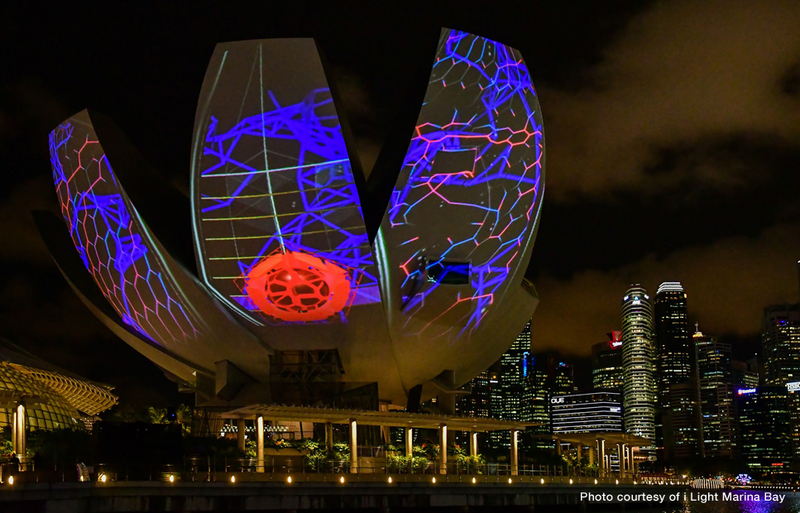 Singaporean audiovisual collective Syndicate, known for its forward-thinking projection at diverse events, created media for projection onto the lotus petals crowning ArtScience Museum. Local artists Brandon Tay, Kiat, and Safuan Johari presented a confluence of ideas expressing the human relationship with the night sky. Seventeen PT-DZ21K 3-Chip DLP™ quad-lamp projectors serving 20,000 lumens at WUXGA resolution created a uniform image across multiple curved screens. As it was the first time that images would be projection-mapped on Merlion at i Light, Panasonic visited the site to determine positions for three projector towers. Instead of calibrating each unit with grid-by-grid alignment, Panasonic deployed ET-CUK10 software to process all reference points for every unit at once using a camera, creating a seamless display and reducing setup time by 80 percent. Panasonic selected the PT-DZ21K not only for requisite power, but also for efficiency. With a lamp replacement cycle of 2,000 hours—more than double some competitive products—the projectors saved on consumable parts while using less energy. The PT-DZ21K supports Geometry Manager Pro, proprietary software enabling projector and lens alignment, geometric correction, and edge blending as well as adjustments for uniformity, brightness control, color matching, and masking. French multidisciplinary art and design collective, Danny Rose, a team that specializes in development of super-sized audiovisual shows, interactive 3D mapping on urban surfaces, and more, created breathtaking visuals for projection onto Singapore’s famous Merlion statue. For “The Body of the Sea”, Danny Rose dressed Merlion in brilliant marine life revealed in washes of virtual seawater. To realize its vision, Panasonic selected three of its high-brightness flagships, the PT-RZ31K 3-Chip DLP™ SOLID SHINE Laser projector, delivering 30,000 lumens at WUXGA. Because of Merlion’s complex shape, on-site obstructions, and limited throw distance, Panasonic fitted one ET-D75LE10 and two ET-D75LE6 ultra-short-throw lenses and oriented the projectors in Portrait Mode. This allowed for necessary coverage including overlap for edge blending using fewer projectors. With proprietary simulation software, images were precisely aligned for astonishing realism. The PT-RZ31K proved ideal in this application with the SOLID SHINE Laser Phosphor drive enabling trouble-free portrait orientation, while eco-friendly lampless design eliminated need of consumable parts disposal. Interchangeable 3-Chip DLP™ lenses were also invaluable where multiple high-brightness units were employed at different distances.